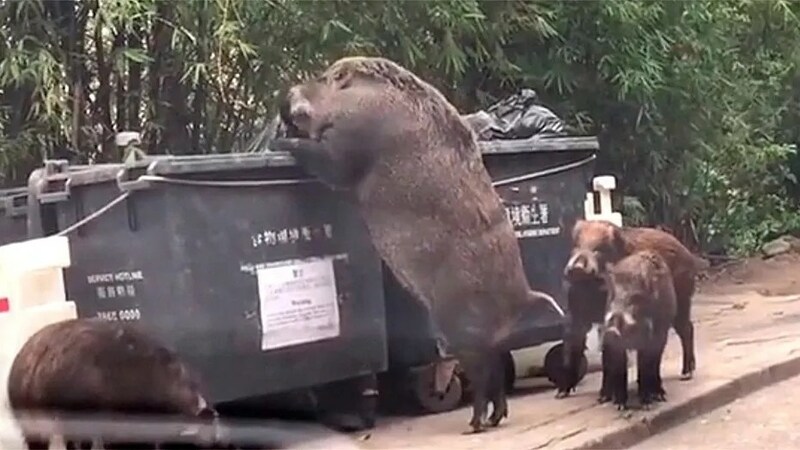 The moment a gigantic boar stands on his hind legs to chow down on garbage has been caught on camera — but it’s where the animal is doing it that’s causing concern. It’s already been shared more than 4,600 times and has racked up 300,000 views. More than 2,500 social media users also commented on the video, many of which expressed concern about how close the wild pigs were to the school. The footage shows the boar trying to pull a black garbage bag out of the can while his piglets stand guard. In Australia, feral pigs were declared pest animals in 2013, meaning they can be legally killed by farm owners. In July 2013, a 10-year-old boy was gored in the neck by a wild boar at an Australian beach. He had been riding his bike when the pig charged at him and stabbed him in the neck with his tusk. Feral pigs are also known to cause significant economic losses to agriculture by damaging crops, water holes and fencing. There are strict laws in place to deter people from transporting and releasing live feral pigs, with fines starting at $2,200 for possessing a wild animal. Fines climb to $22,000 for transporting live feral pigs.